I have an Asus eeepc v701 thats pretty good. I run debian on it with no problems. The newer models of eeepc probably have much higher specs than mine, so maybe you should look into one of those? I run debian on mine and the only beef I have with my version is the hard drive is actually a flash drive thats soldered directly to the motherboard. It’s got 3 usb 2.0 ports, an SDHC card reader, and a well supported wireless g card, as well as a built-in microphone, tinny little speakers, and a decent webcam. If I were to buy one now, I would get a newer model though, as I think they have changed the method of storage in the newer ones to something that’s not soldered on. They might not be worth it for the price, but I would look into it if I were you. I love mine. I have an Asus EEEPc 900. 20GB solid state HD. It has an SDHC card reader and for $10 I added an additional 16GB of memory. Wireless works like a champ, the battery has a tremendous lifespan and bluetooth (though I have not yet used my phone as a modem). It’s a champ of a computer. I love it (and use it) more than my Gateway and Lenovo laptops. The specifications on the eee901 look quite appealing – decent sized for a solid-state drive, plus all but one of the optional features that I would like (webcam, built-in microphone, built-in bluetooth). I assume the video is the current Open-source-supported-3D-acceleration Intel chipset. The only missing feature is 2GB of RAM, which judging by the “people who bought this also bought…” entry is easily upgradeable. AND it’s actually in stock! 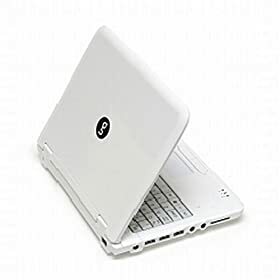 How is the keyboard on the eeePC’s? The keyboard takes some getting used to. I’m about to get a rollup USB keyboard for mine for when I really don’t want to drag my full-sized Lenovo laptop around with me to conferences but I don’t want to make as many mistakes typing as I do when I’m writing on my Asus. The longer I type on it, the easier it is … but I do miss the number pad on the right hand side of the keyboard. The keyboard itself appears sturdy and durable (been using it for 6 months now with no complaints) … and though YMMV it’s the impression I get from the entire computer. As I said up above though, you can get a 160GB EEEPc 900HA with a 160 GB HD but it comes with XP. It may be the compromise you’d seek especially if you were going to install a new OS anyways.